Standing inside a crater, it looks like mountains surround you. 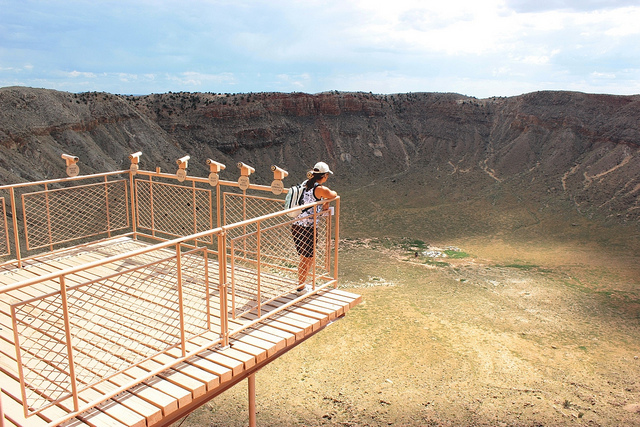 But if you climb out to get a better view, you can see it’s actually a huge hole in the ground. That’s pretty analogous to what the Wall Street implosion of 2007 did to the American middle class. 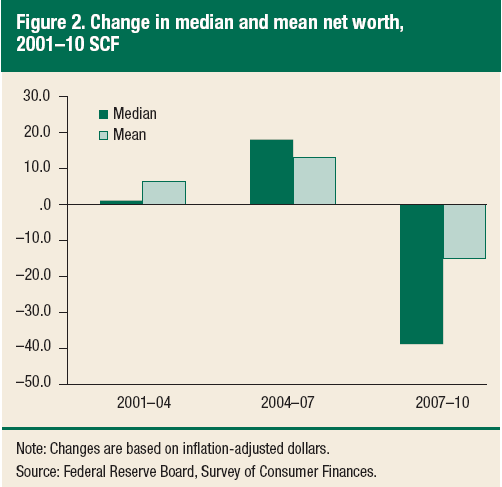 According to a new Federal Reserve report, median household net worth – a barometer for the economic health of working class households – took a huge hit from the Great Recession, dropping from $126,400 in 2007 to an 18-year low of just $77,300 in 2010. That’s stunning: a 39% decrease in household net worth. Not surprisingly, the report cites the slump in home prices as a key factor in the drop, but the recession did more than decimate home equity. Over the same three year period, middle class Americans saw sharp declines in their income. Median income fell by nearly 8%, dropping from nearly $49,600 to $45,800. Americans are also facing major setbacks in preparing for retirement. The number of families with retirement accounts fell 2.6 percent, erasing virtually all gains made from 2004 to 2007. The largest decline in retirement account ownership was among middle-income families, who utilize such accounts to supplement Social Security income. Median holdings in retirement accounts also fell 6.6 percent, indicating an even greater setback in retirement planning. Even as top incomes have begun to recover and Wall Street bonuses have bounced back to near pre-recession levels, middle class families are feeling little relief from the recession’s effects – in fact, higher college costs, diminished savings, weakened retirement accounts and stagnant wages are daily reminders of the simple fact that the brunt of the economic storm is truly being borne by middle and lower class families. When middle class families have money to spend, they create demand and drive economic growth through a virtuous cycle of spending and investment. But when middle class incomes are stagnant and wealth accrues only to those at the top, the second yacht problem depresses demand, which prevents businesses from hiring and the economy from recovering. Only restoring the purchasing power of the middle class – with higher wages and lower costs – will get our American economy rolling again. That or rich guys like Nick Hanauer are going to have to buy a lot more pants.